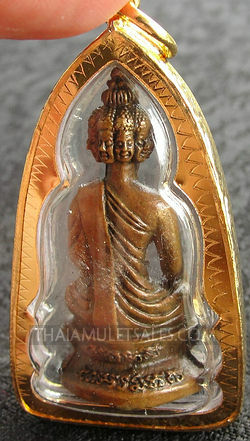 Phra Nawagote, a 9-headed Buddhist figure, represents 9 different Buddhist millionaires in the time of Buddha. 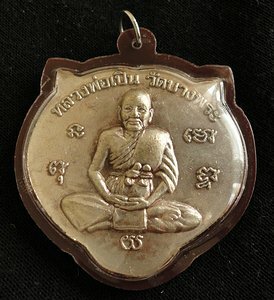 Buddha said that these 9 were the ones that gave the most money toward helping to develop Buddhism. 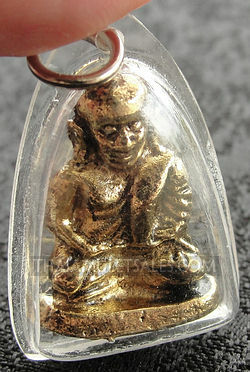 This amulet brings owners out of poverty and into a prosperous, good and happy life. When you give this amulet to someone – it’s the most powerful gesture. 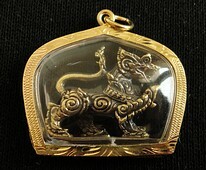 + Free Necklace! 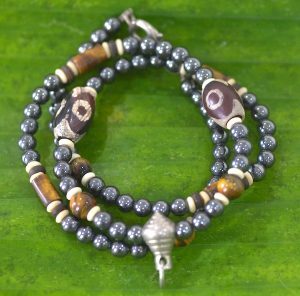 + 2 Free Bracelets! + Free worldwide shipping! 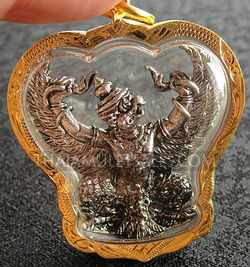 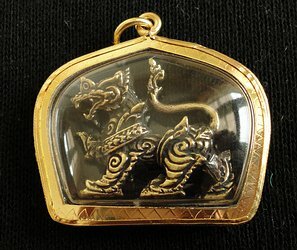 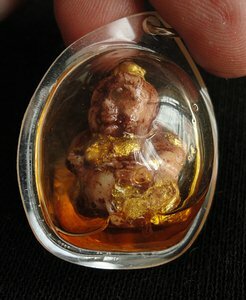 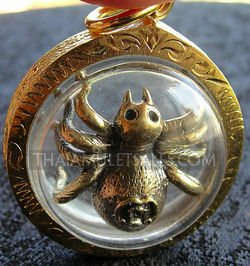 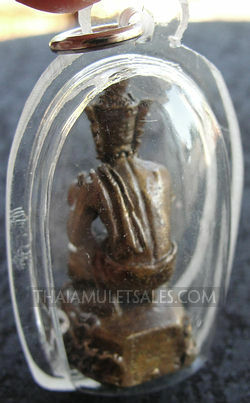 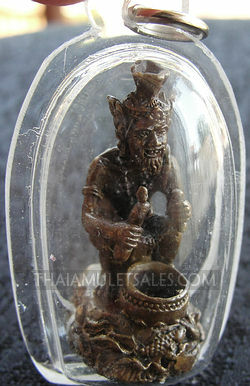 Thais use the demon amulets below to protect themselves from the worst of the demons in the spirit world. 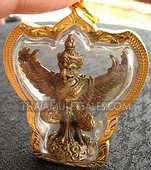 Thailand believes in Animism, many of the practices Thai people follow are based on their knowledge of Animism as well as Buddhism. 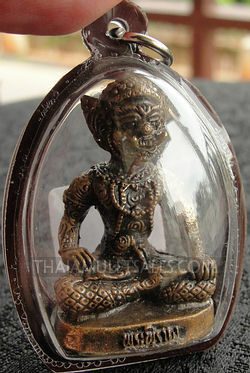 Spirit houses fill Thailand – as places bad spirits, roaming spirits can settle down and stay so they don’t bother Thai people in their homes, businesses, or the streets. 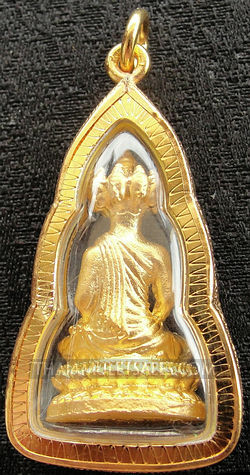 Phra Lersi – from Sanskrit language. 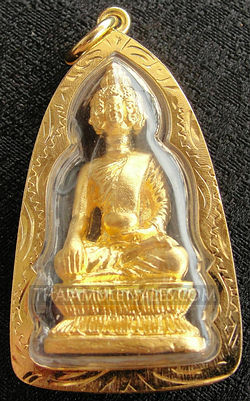 Forest monk. 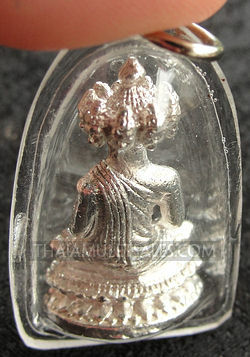 Believed in purifying body and mind – to purify soul. Usually shown as old man with cone hat, tiger skins. 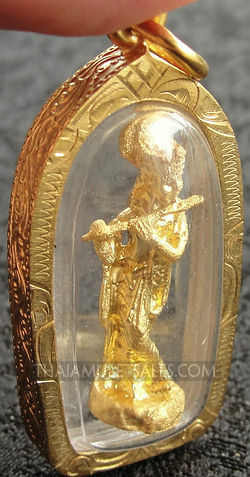 Founders of magical arts. 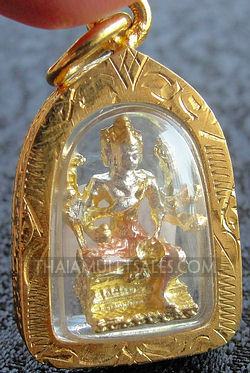 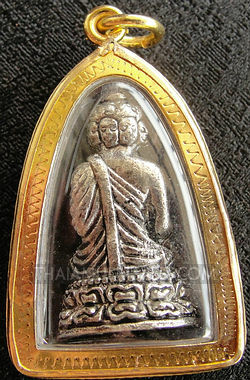 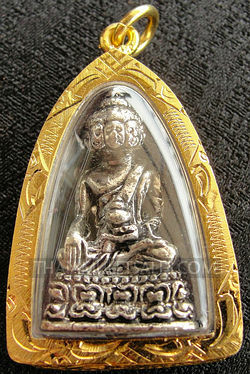 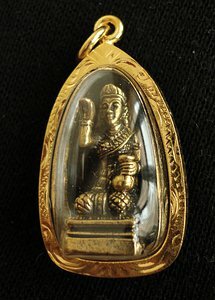 Carriers of Phra Lersi amulets and charms are believed to be protected from evil spirits and black magic. 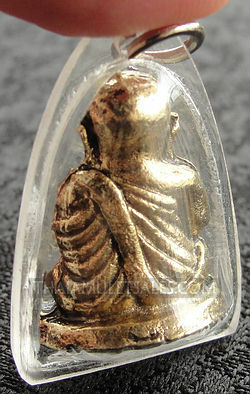 Lersi is an ascetic – a hermit from the time before the Buddha. 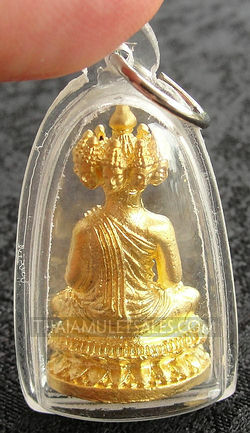 Big Ear Monk in Waterproof CaseI can’t remember his name, will look it up later. 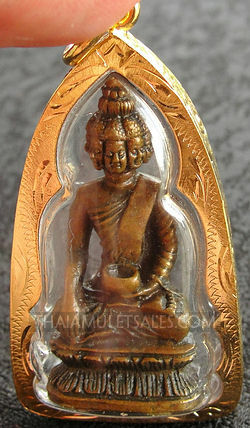 He was said to resemble the Buddha very much. 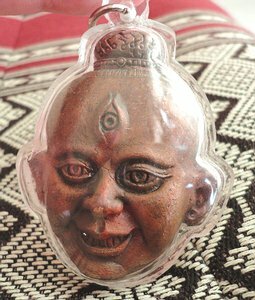 Instead of that, he changed himself into a very ugly monk with very large ears. 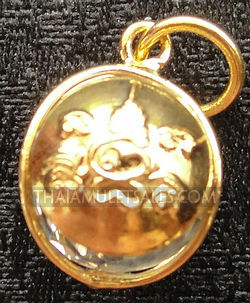 Solid Brass, very heavy. I considered keeping this one myself!There is an eyelet for a chain on the brass tooth so you don’t need the silver case if you don’t want it. 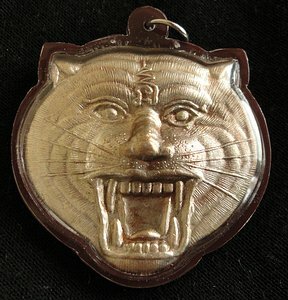 We’ll send it – you can take it out if you prefer. 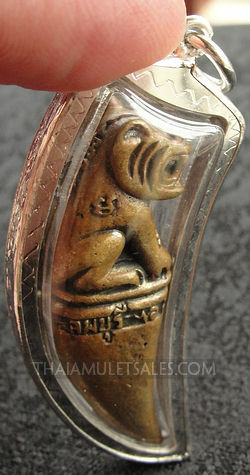 Naga Eye Amulets – are from the Naga (serpent). 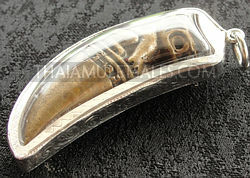 Also known as Power Stones and Naga Pet – diamonds. They are known to have 4th dimensional power, including protecting the one carrying it from any water peril – tsunamis, floods, etc. 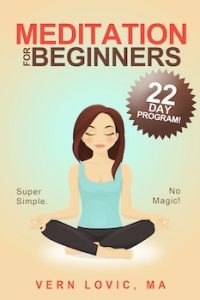 They are known to increase the extrasensory perception that already resides within each of us. 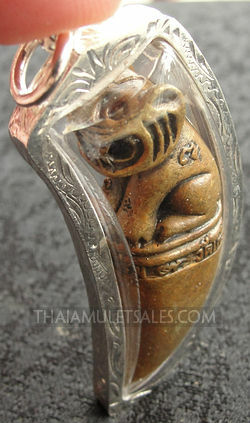 Naga eyes began in Nong Khai – northeastern Thailand above Mahasarakam. 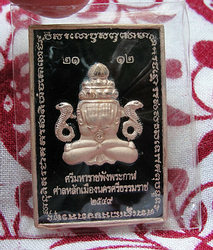 I’ve been there – but have not been there to see the Nagas. 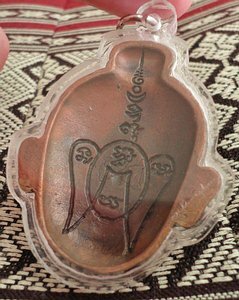 There is a festival yearly where people go to watch the eyes above the river. 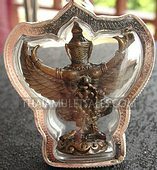 Garuda is a half bird, half man deity. 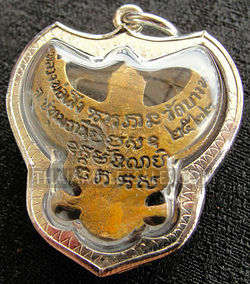 Head and wings of a large bird and human body. His face is white, the mouth red, the body green.Inspired by Hindu mythology Garuda is a powerful god that sometimes comes down to be among humans on earth. 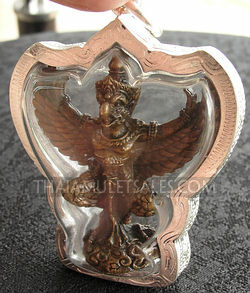 In Thai stories the Garuda is the king of all birds. 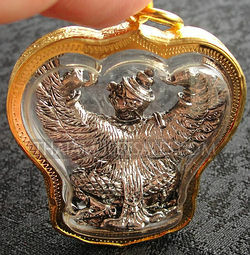 Like an eagle. 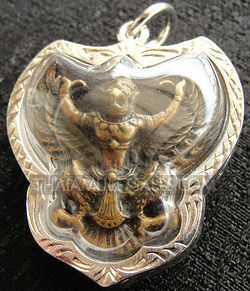 The Garuda ripped apart the Naga serpent into two pieces. 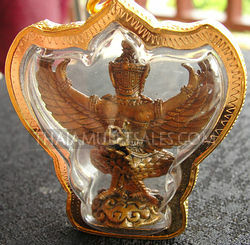 Garuda is a symbol for the Thai Monarchy and the official seal of the Thai government. 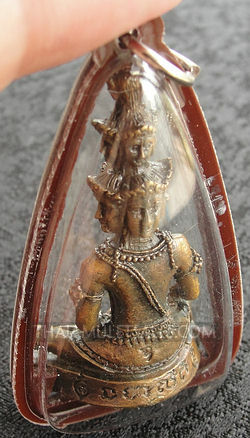 Born to Kasyapa (father) and Vinata (mother). Some believe that Garuda is an incarnation of Vishnu – the Hindu god that symbolizes peace and an end to suffering on earth. Garuda is said to be as powerful as the Fire God. 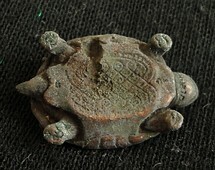 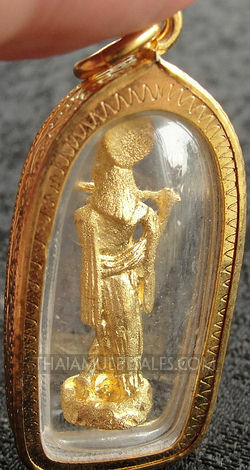 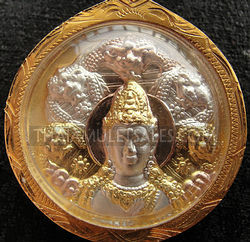 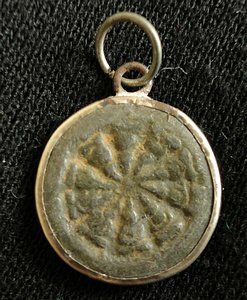 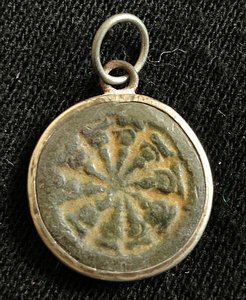 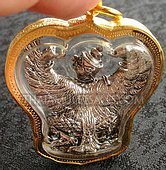 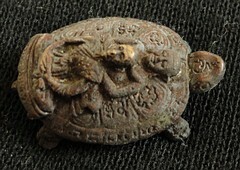 This amulet may have a metal rim case with plastic protective piece, or all plastic as this one shown. 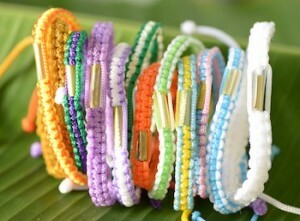 again if you want one, let us know. Nong Kwak is the Buddhist symbol for money coming in. 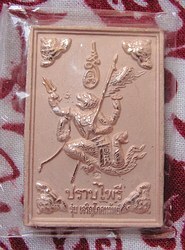 Many Thailand businesses have Nong Kwak featured prominently at an altar up high above head level. How much is the piece of amulet TURT4 including shipping to Singapore? 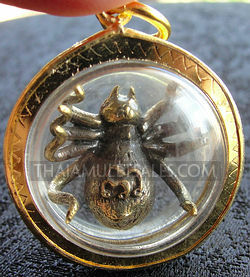 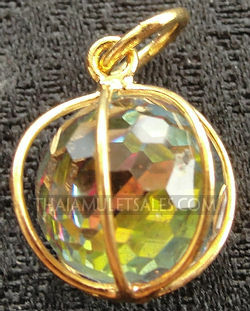 We wrote you email a minute ago to tell you about the TURT4 amulet and free shipping to Singapore! 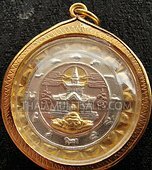 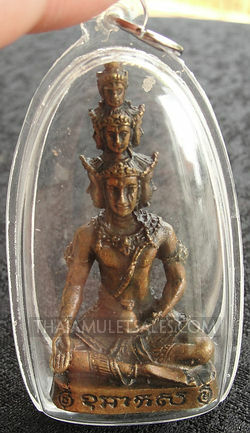 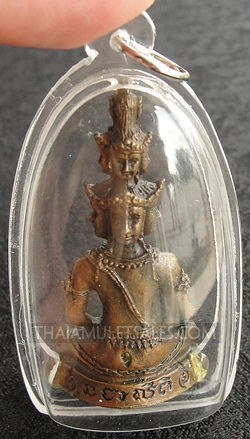 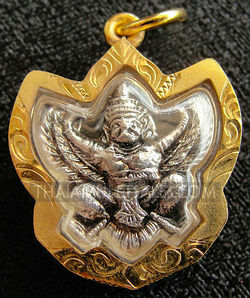 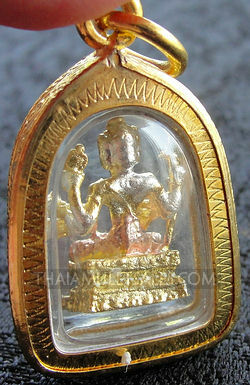 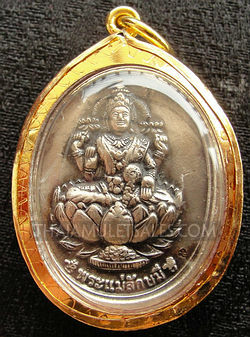 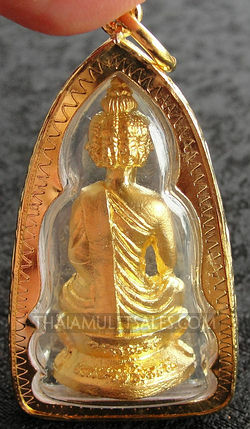 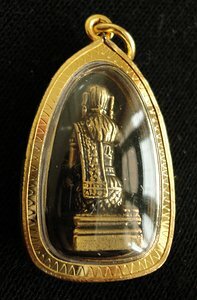 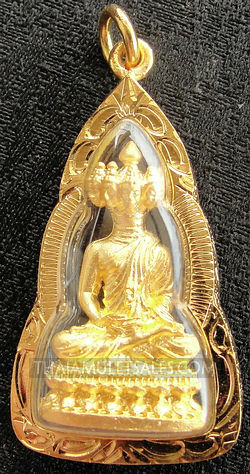 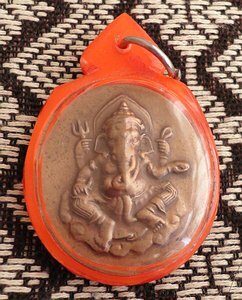 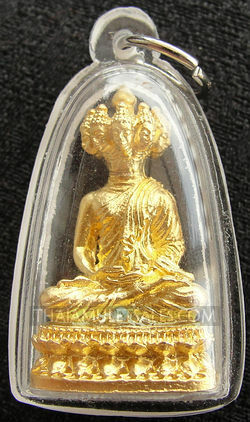 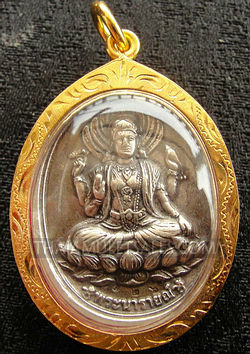 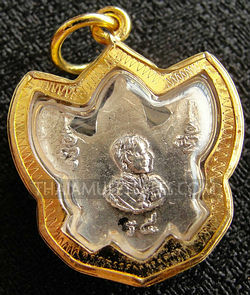 Do you have amulets from Wat Wichit Dittharam in Tha Chana?